Driving along the back roads of Upstate New York a couple of years ago, Jim Hodges looked up at the gorgeous, brooding clouds shot through with rays of sunlight. In a flash of clarity, he knew he could make that sky out of denim. For many months after that day, he worked through stacks of thrift-shop jeans as his palette, spanning the spectrum of blue from almost white to deep indigo. He cut and layered the jeans into freeform shapes that echo the shifting hues and patterns of clouds, which he sewed together into a monumental tapestry memorializing the majesty and menace of just such a sky. The artist’s denim collage Untitled (one day it all comes true), 2013. “A denim sky feels like a very American landscape to me,” Hodges says. While Hodges had taken hundreds of photographs of events in the sky, he was constructing his denim collage in a manner typical for him—piece by piece, with only a loose framework in mind and letting himself get swept up in the process. Mining the esthetic and symbolic potential of commonplace materials through disassembly and collage is something the 56-year-old artist has been doing to sublime effect for more than two decades, with ordinary items such as paper napkins, artificial flowers, lightbulbs, mirrors, sheet music, Pantone chips, old clothes, chains, and rocks. The artist’s first comprehensive survey, at the Dallas Museum of Art through January 12 and traveling to the Walker Art Center in Minneapolis in February, traces how universal ideas about time, loss, beauty, identity, love, and nature have rippled across his works in disparate mediums over his entire career. “What’s interesting in Jim’s work is that its appearance may have changed radically over 25 years but there are certain gestures and threads and intentions that were very clearly there from the beginning,” says Jeffrey Grove, the Dallas Museum’s senior curator of special projects and research, who co-organized the show with Olga Viso, executive director of the Walker. Jim Hodges in his New York studio. With a piece acquired last year by the Walker for its outdoor green space adjacent to the sculpture garden, Hodges was able to coax something ephemeral and changeable out of four mammoth granite boulders, each close to the height of a man, that sit atop a hill in a circle. Hodges sheathed the inward-facing side of each rock in a different color of lacquered stainless steel—violet, blue, orange, and gold—creating a dazzling, kaleidoscopic mix of reflected light and color at the center of the circle. “Even as the ambition and scale of his work and the production around it has evolved, he’s maintained that evanescent gesture,” Viso says. From a distance, the sculpture throws hot spots of color and draws people up the hill with its changing light effects. Hodges discovered the boulders in a Massachusetts forest and found them profoundly affecting in their age and mass and presence. The untitled piece was first shown in 2011 at New York’s Gladstone Gallery, where it offered different vantage points and an experience of surprise and theater. It was inspired by a six-week trip to India, where Hodges was fascinated by how Hindus anoint religious objects with tinfoil, pigments, and flowers as acts of devotion. “I really identified with this enthusiasm and expressive celebration with color,” says Hodges. Hodges sheathed four granite boulders in lacquered stainless steel for Untitled, 2011. The sculpture, shown here in New York’s Gladstone Gallery, now sits on a hill near the Walker Art Center in Minneapolis, which acquired the work. Hodges’s receptivity to nature and the visual world around him was stoked during his youth in Spokane, Washington, where he grew up exploring the woods. One of six children in a Catholic family, he could always entertain himself by drawing pictures. His father, who was a salesman, and his mother, a homemaker, encouraged his talent and kept him supplied with materials. He learned to use oil paints in junior high at a Saturday-morning class at the mall, where he and a group of mostly older women painted pictures from calendars. With limited opportunities to see much real art, Hodges was introduced to more sophisticated concepts by an influential high-school art teacher, who suggested he study art at Fort Wright College in Spokane (now Mukogawa Fort Wright Institute). He visited New York for the first time during his senior year in college in 1980 and was blown away by all the museums and galleries. Three years later, he moved to Brooklyn to go to graduate school at the Pratt Institute. “I figured I’d give myself five years to see if I had it in me to commit to being an artist,” says Hodges, who got his M.F.A. in painting in 1986. Hodges was coming out as a gay man around that time, which was both liberating and terrifying as HIV was devastating his community of friends. He also abandoned painting. “I was overwhelmed by the choices in painting,” says Hodges. So he narrowed his focus to exploring the properties of basic materials such as charcoal, paper, tape, and discarded items. He was influenced by the freedom of Richard Tuttle’s light touch with throwaway objects and Eva Hesse’s organic approach to Minimalism. “She meant a lot to me as far as finding poetry and language through manipulations of materials symbolically,” he says. 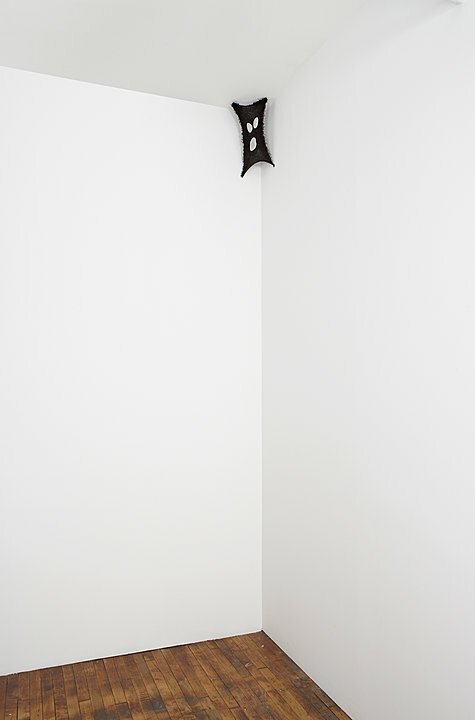 In one of his first works, done in 1987 and included in the Dallas retrospective, Hodges created a ghoulish face by partially unraveling a black ski mask that he tacked up in the corner of a room, which he ominously titled Good Luck. It resonates structurally with the intricate spiderwebs he started in 1989 and continued making until 2001 from jewelers’ chain, a material he liked for how it reflects light and can become almost invisible. He situated some webs in corners of rooms and other fugitive spaces, some across doorways or entire rooms like gateways that deny entry, some entwined with clothing or artificial flower petals. Seemingly ephemeral yet made from hard, permanent metal, the webs suggest both elegy and metamorphosis. Hodges’s breakthrough in the art world came in 1994, with his widely acclaimed first solo exhibition at CRG Gallery in New York. 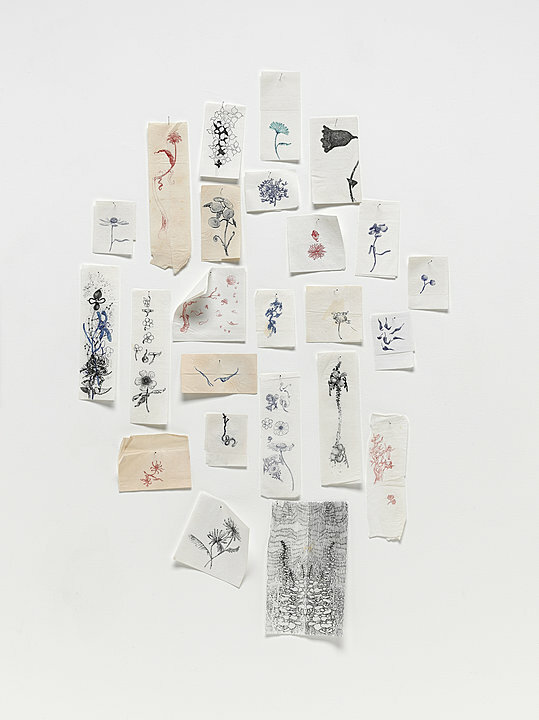 There, he showed A Diary of Flowers, a mosaic of 565 single flowers drawn on paper napkins and pinned to the wall. He had begun the drawings without intention, pulling leftover napkins out of his knapsack to sketch on while sitting alone at coffee shops. After pinning some on a wall, he realized they created a unified whole, so he continued to make them—never throwing any away, no matter what he thought about them. “I set out to make an accurate record of something, recording the minutes of time,” he says. From these fleeting moments, he constructed a disarmingly monumental and poetic statement. It hit a nerve with critics, who tended to frame it through the prism of AIDS and death. Untitled, 2011, mirror ball, mechanics, and water. Camouflage patterns recur across many of his pieces. Hodges has always liked camouflage clothing and was interested to learn that the motif originated as another artist’s stylized rendering of nature, which was later co-opted by the military as well as by artists like Andy Warhol and Alighiero Boetti. Hodges reworked the familiar four-tone design in a hand-embroidered tapestry adorned with flowers, branches, and pinecones in a 2003 piece called All in the field. His outdoor sculpture Look and See, a Creative Time commission shown in Battery Park in Lower Manhattan in 2005, blows up the classic camouflage design in large scale on a stainless-steel “S” curve. He painted two tones of the pattern in black and white, left reflective stainless steel for the third tone, and cut away the fourth so that the colors of the park filled in the negative space. “It was a very lively and confusing experiential thing,” he says. Back in his studio, Hodges was making his own abstract approximation of the natural patterning of the woods by layering organic shapes cut out of gold leaf and gluing them onto a canvas of stretched denim. The ethereal quality of this golden piece was a beautiful counterbalance to the durable tactility of the denim sky taking shape on the wall nearby.